There haven't been as many posts as usual in my RSS feeds this week. 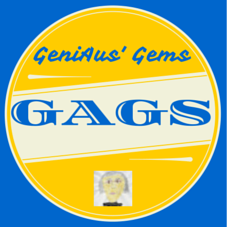 Perhaps Australian genies are otherwise engaged with National Family History Month. I look forward to reading many reports from those who attend #NFHM16 events over the next four weeks. 1. Jennifer has a busy program lined up. 2. I've always the Common Craft videos. Thanks to Richard for sharing this "new to me" one. 3. A beaut image always encourages me to read on. 4. So important for our youngsters. Wouldn't hurt we oldies either. 5. I too enjoyed this book. 6. Newbies can be sucked in by WDYTYA. 7. For the writers amongst us - some very alternatives. 8. Kate enjoyed her visit to the BC Archives. 9. I'm a "No gloves" girl. What's your opinion? 10. Get organized with Drew. 11. Maria was out of luck. 12. A humble roll of toilet paper tells a story. 1. Googling one of my DNA matches I found she had a blog.